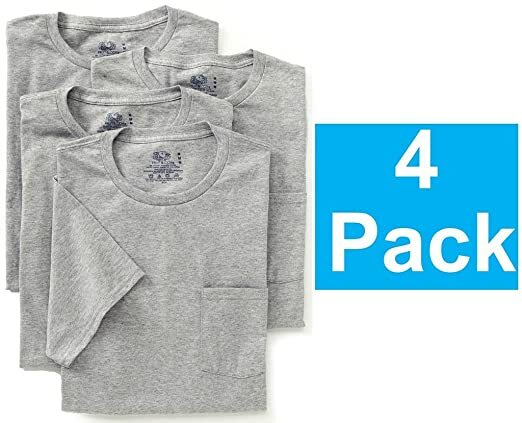 On Hubby’s Christmas/Birthday list this year was one very simple thing – grey t-shirts with a pocket. Well, hey, that ought to be easy, I thought. After visiting two stores, one of which didn’t have them and one that was out of them, I decided to turn to Amazon. Even though the listing said I could get some grey t-shirts through Amazon Prime (which was important as his birthday was coming up shortly and I need them fast) when I went to check out there was no free one or two day shipping. For once, Amazon failed me! I visited two more stores, and, once again, it appeared one didn’t carry the grey t-shirts and the other one was out. Sigh. Hubby did not get grey t-shirts with pockets for Christmas or his birthday! But I told him I would keep an eye out for them. Night before last I must have had one crazy dream, but have no memory of it what so ever. I woke up about 5 am to use the restroom and noticed that the blanket on the bed was pulled waaaaay up, leaving about two feet at the bottom of the bed uncovered. I am surprised my feet weren’t cold! Then, last night, Hubby told me how in the middle of the previous night I gave the blanket a big old tug my direction, leaving him with only the bottom half of him covered. Just as he was thinking how THAT had never happened before, I gave the blanket another BIG tug, leaving only his feet and ankles covered. At that point he admitted defeat and retreated to the couch! I can tell Christmas is over because visits to my blog have plummeted. At Christmas time, I get a lot of visits from people looking at my “Fun Christmas Game” post. Feel free to tell your friends what a great blog I have! LOL! It is turning in to one of those days. Today is Hubby’s birthday. We celebrated as a family yesterday (more on that later) but today is the official day and Hubby decided to take it off from work. Good thing, as something went wrong on one of the circuits in the kitchen last night, making both the microwave and stove unusable. Oh boy! I told Hubby this was karma’s way of making sure he knows that at 58 he is still a useful member of the family. He just grunted. So instead of doing whatever he wanted, Hubby has been trouble shooting the situation, consulting with a friend on the phone (Thanks Ross!) and otherwise trying to decide if it is something he can fix or a problem for an electrician. Meanwhile, it is raining. This is not a bad thing. We need the rain! It did make my hair go wild, so not one of my better days for photos. Thank goodness, no photos need to be taken! LOL! On the plus side, Dax seems to be feeling better after almost a week of ear drops to treat his ear infection. He is shaking his head less and just seems a bit perkier. Here is hoping a few more days of the medicine and he will be right as rain. Because, if all is well with the pets, then all is well with the world, right? Anyway, as I said, today has turned into one of those days. Hope your day is going better! Today was January 2nd and we were off to the veterinarian. So, starting the year off as usual for us, with pet problems. Dax has had ongoing issues with his ears and it isn’t going away. He has been treated for ear mites three different ways, so it was time to do further investigation. Sure enough, the doctor took a swab and looked at it under a microscope. Two types of bacteria and yeast as well. No ear mites at all. The doctor said if the problem comes back, he would suggest treating it once more and then, if it persists, we will have to assume it is a food allergy and go from there. Oh goody! We hope this makes poor Dax more comfortable. All we want is for him to lead a happy life at our house. Instead, it had been three months of annoyed ears! My ears are pink and itchy! 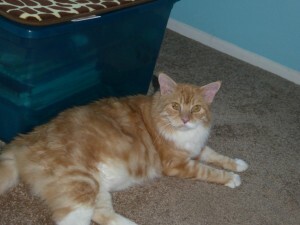 Around our house it saw the loss of two beloved pets and the addition of a new rescue cat into our lives. It also saw me start to feed and get way too attached to the feral cat that lives in the neighborhood. We saw both daughters make big strides forward into adulthood. However hard that is for us as parents to deal with, I am very proud of my girls. We had some epic vacations. 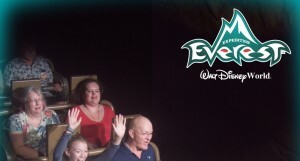 The girls went places on their own and we went as a family to Disney World. Hubby and I had the amazing experiance of seeing the total eclipse with the addition of the adventure of trying to get back to our hotel when it was over. On the local, state and national political level, things didn’t go quite as I had hoped. I feel like we are, at every level, being ignored while our leaders act like they know everything, we know nothing, and we should all just sit down and shut up while they have fun playing with their power. Sigh. Yes, I have strong feelings about this. Most of all, this year has gone by amazingly fast. I didn’t get anything done around the house that I had hoped to get done. I spent way too much time in doctor’s offices, which is likely why those home improvement projects didn’t get done. I am determined to see at least some of the projects through in 2018, however. Finally, I enjoyed writing this blog and hearing from all of you. It is a highlight of my day, week, month and year. I wish all of you a wonderful 2018. See you next year!!!! In other words, tomorrow! You could say life was a bit of a roller coaster in 2017. 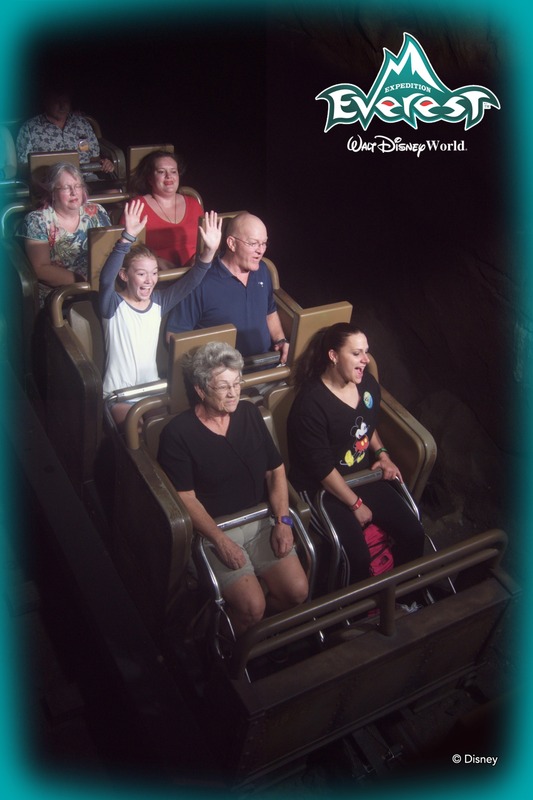 But, like on real roller coasters, I believe in clenching my teeth and getting though it! LOL! This is another post that got lost in the shuffle. But, before the year is over, I wanted to remember David Cassidy, who died this year. When I was in elementary school my very best friend was a girl named Myra. Every recess we played together. Other friends came and went but we were besties. Our favorite thing to play during those recesses was “house.” In those days our playground was dirt, covered in a layer of fine gravel. We would dig the heels of our leather school shoes into the dirt and drag them along, making lines to represent the walls of our houses. She had one house, I had another right next door. Of course, if we had houses, we had to have husbands. Mine was always teen heart throb Bobby Sherman. Myra’s was another teen heart throb, David Cassidy. On so many days, it was just Myra and me and Bobby and David, having a good time on the playground. Of course, I also watched the Partridge Family. Boy, what a wonderful night of TV it was the night the Brady Bunch followed by the Partridge Family was on. 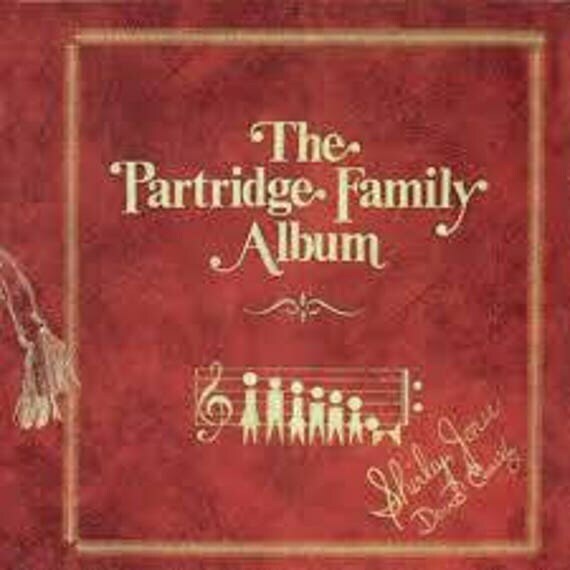 My very fist album was a Partridge Family album. The second was Bobby Sherman, each bought with my own money. Rest in peace, David Cassidy. You were a great neighbor, back in those long ago days on the playground. I was not able to go to Room 8 for much longer than I would have liked, primarily because I was sick, but also because of the holidays. I went back today, with a bit of a dread feeling in my stomach. Call it a psychic moment, but it was a real one. Dear drooling Joey is no longer at Room 8. 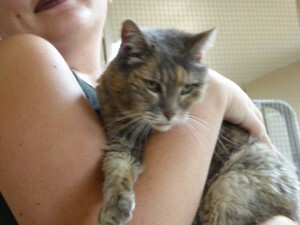 Joey, the girl cat with a boy name, lived many years with an older husband and wife. When the wife got Alzheimer’s and the couple moved into a senior facility together, they could not take Joey along. 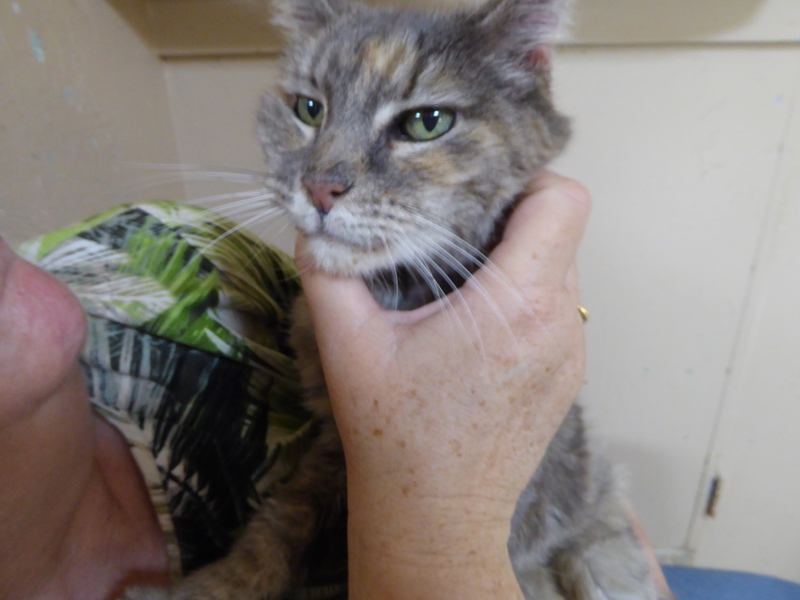 Room 8, whose original mission was to take in elderly cats that had nowhere else to go, took in Joey. They were told she was 25. She was not, of course, as she lived for several more years. 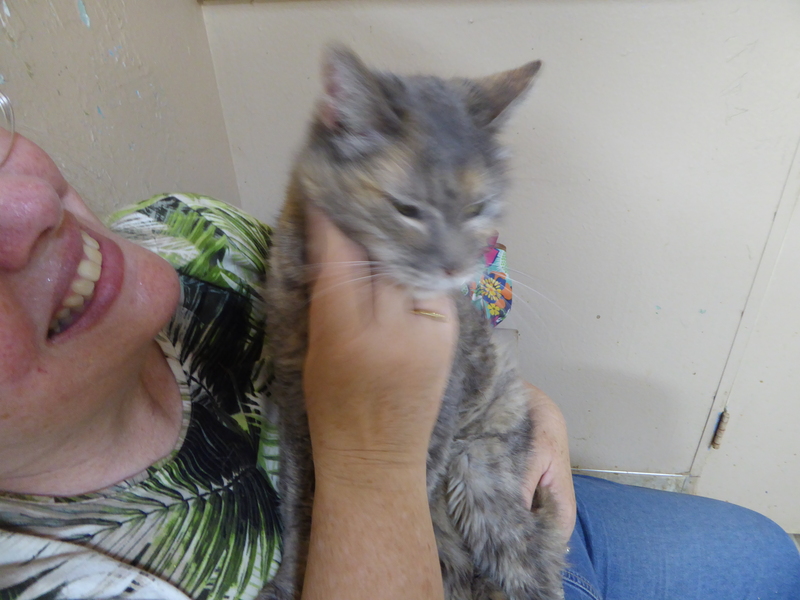 Any visitor to the elderly cat room who sat down would soon have Joey in their lap. purring and drooling all over them. As Joey grew older, she became less content hanging out in the elderly cat room. She came up with pitiful and demanding cries, as only a cat can. Those cries led to her being let out to roam the place as she saw fit, which, or course, led to more pitiful and demanding cries. The last several months of her life Joey could often be found curled up sleeping on the only office chair in the place, near the front door. 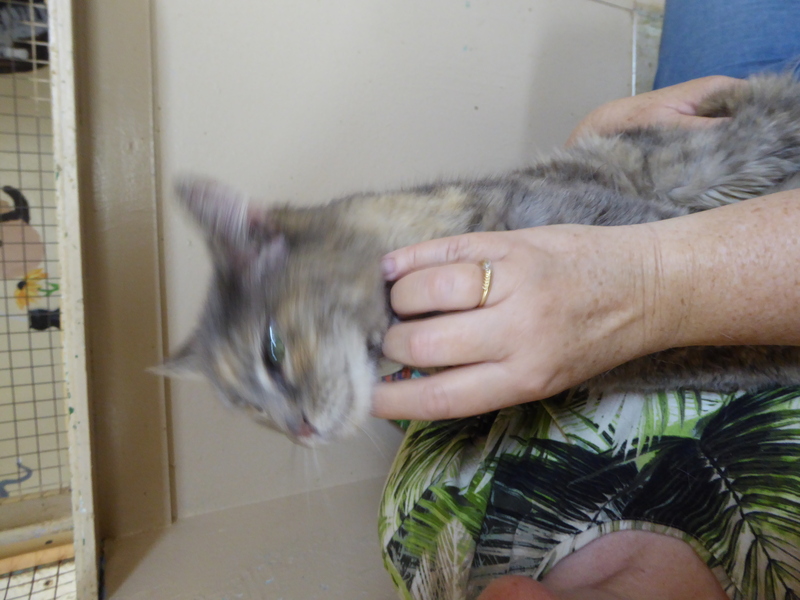 However, she was fine if someone walked in, scooped her up, and sat on the chair themselves, as long as they held her and let her drool and purr. 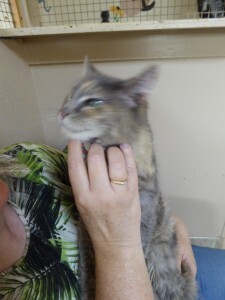 In spite of her advanced age and scrawny self, Joey was not above taking a swipe and a growl and a hiss at Dagwood, another much younger cat who is also allowed to roam the place. Everyone assumed Dagwood was starting it, but direct observation showed there was still some pep left in Joey. Sadly, the elderly dear broke her leg and it was decided, due to her advanced age (they think around 18) to not put her through the pain of trying to set her leg. Joey was well known to the many volunteers at Room 8, had a comfortable place to live out her life, and is missed by many. If only every cat had as much at the end of their life. I am behind in posting this but another birthday rolled around a little over a month ago. I am now 56 big ones. The girls expressed great surprise that I am that old, as it seems to them I have been hanging out in my early 50s for quite some time. I fully admit that my early 50s seemed to go on forever to me as well, There was a lot of water that went under the bridge during those years. 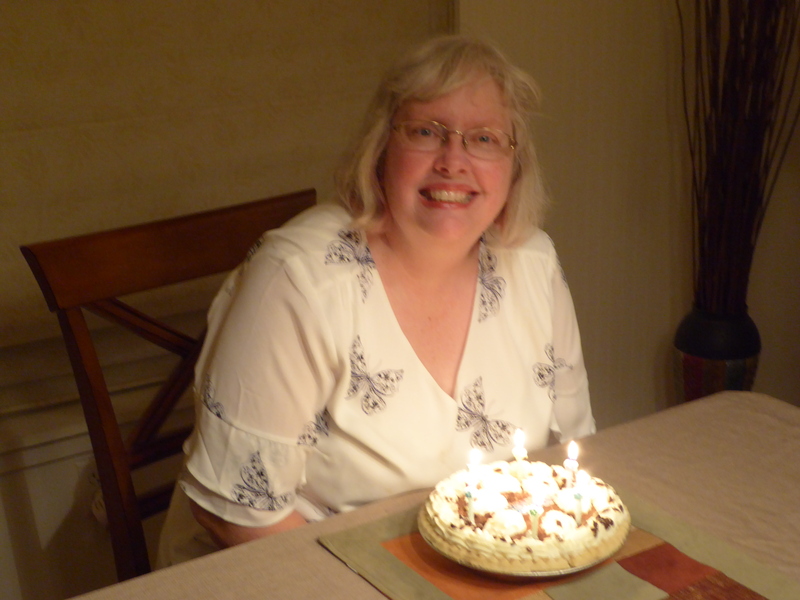 However, I am now really and officially out of my early 50s and am now in what I am going to call my “mid fifties.” I think I can stick with that term until I am 59. Then I will only have to spend one year in my late fifties before I go back to being in the early category again. It is just a number. But it is definitely a number that is on the downward slide to 60. The funny thing is, it is always Hubby’s age that gets me. He is two years older than I am, so I know whatever age he is, is just around the comer for me. One of our children was expressing dismay that he will be 58 on his next birthday. I tried to ignore that remark! I had a lovely day with my family for my birthday, in spite of the cold that I brought home from Disney World. We visited a decorated Christmas tree event we have been enjoying for over a decade. Then we went to the city of Orange (in neighboring Orange County), which has a huge historic downtown. I loved visiting the various shops, including several antique shops. We just scratched the surface of that area and I look forward to going back there again. We had lunch at a BBQ place and later had burgers and birthday pie back home. Oh, and there were presents, too! All in all, a wonderful day! 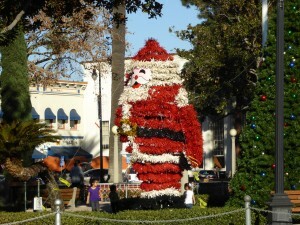 Christmas decorations in Downtown Orange. Thank goodness there weren’t 56 candles on my pie. It would have melted away! Back on December 14th, at 9:20 p.m., I realized, just like that, that I had a sore throat and running sinuses. And, just like that,the holiday season took a detour for me. I managed to hold it together for two more days, until the children’s Christmas party charity I am part of made the season brighter for about 700 kids. Then it was lights out for me, and still is, to some extent. The cold went right to my chest and I developed a cough that was so loud and horrible I couldn’t leave the house. On the rare occasion I did it was not for very long. There were a couple of trips to the grocery store, 15 minutes in a Kohl’s, and the occasional visit to a Starbucks. Otherwise, I binged watched The Crown (which I highly recommend) and BBC shows. I watched so many people with British accents, it is surprising I haven’t developed an accent myself! It is the pits being sick at Christmas time. I missed out on various events at church, including Youngest Daughter’s second bell choir performance. I missed the first chance to meet the new boyfriend, as he cane to see the bell performance. I had entered a 24 hour period of not getting out of my pajamas at that point, so I didn’t leave the house that day. Meanwhile, I talked to a doctor on the phone and two days later I visited one in person. Not much they can do, but I got everything that I could get to try and calm the bronchitis and accompanying cough. On the plus side, the house was almost completely decorated and almost all the gifts were bought when I went down for the count. That took a load off my mind and made the TV binge watching even more enjoyable. We had already planned to eat out on Christmas day, so I didn’t have to worry about planning and cooking a big meal, either. And I finally got the meet the new boyfriend on Christmas evening. I am happy to report the coughing is …less….It has not gone away and does not give any hint that it will go away any time soon. However, I am getting out and about more and I still enjoyed Christmas, in spite of it all. Being sick at Christmas means you have permission to let go of any perfectionist tendencies. And, boy, I let those go! In the end I am just happy it appears no one in the family caught what I have and that I have had the chance to slow down and get better. I hope your Christmas was lovely, with less coughing than ours, and I wish you all matter of wonderful things in the new year! Christmas morning. Nox had to be in the middle of the action. And a Happy Mew Year! 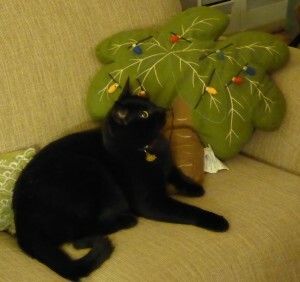 Nox is on the couch with my favorite Christmas pillow – a palm tree with lights! He is looking at the Christmas tree, which he finds so interesting. 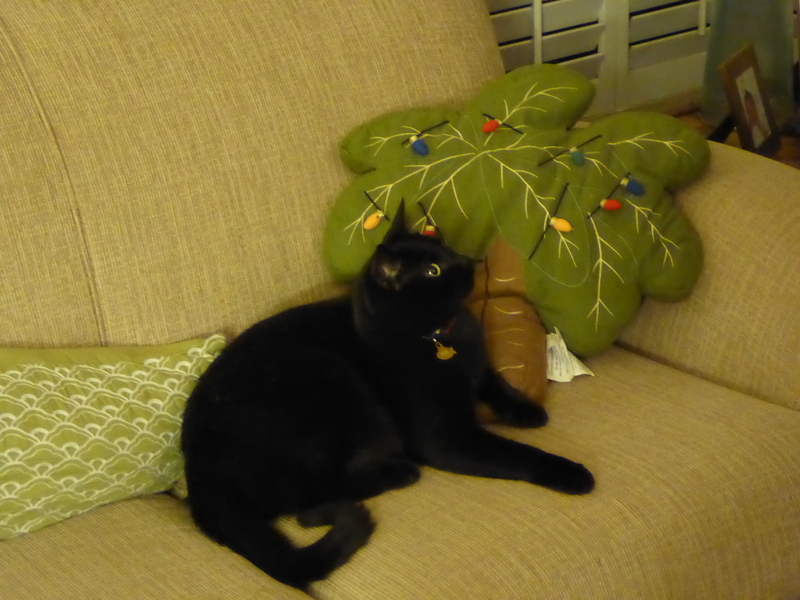 Every day he finds a new ornament to knock to the floor! 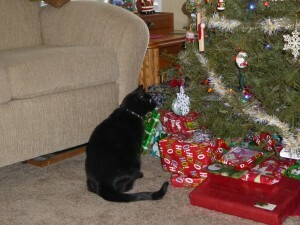 He is definitely our Christmas cat! December 2017 will be remembered for the wind. It just won’t stop. Cold wind, hot wind, just strong winds. Sadly, our orange tree has taken a severe beating from the wind. It has a terrible case of wind burn. The poor thing looks half dead. I don’t think it is, but it looks that way with its curled up, dry leaves over about half or two thirds of the tree. 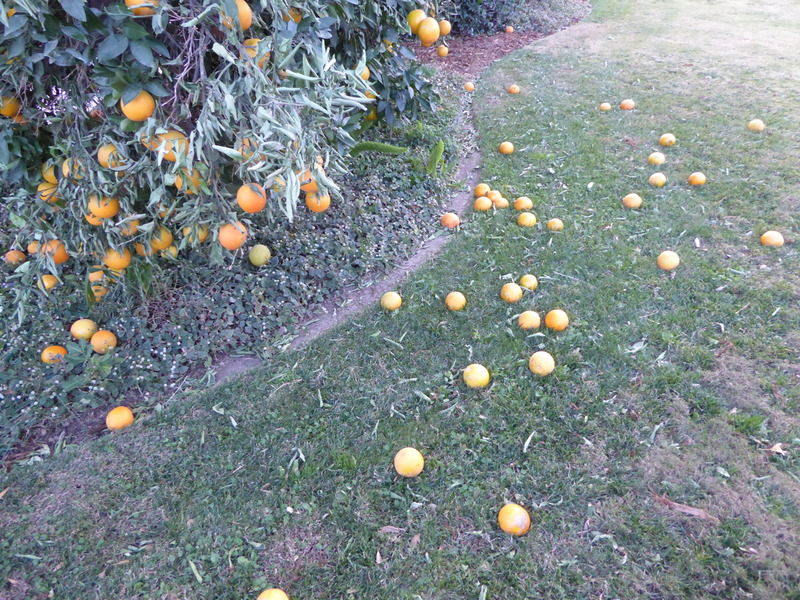 Even sadder, is the number of oranges that are now on the ground, just shy of being fully ripe. Oranges on the ground. This doesn’t look so bad. It was about a bag full. But after I picked these up we got more wind, which knocked another two bags full on to the lawn. 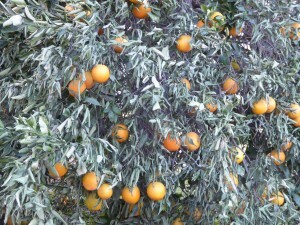 And that doesn’t count all the oranges directly under the tree in the ground cover that we have not picked up yet. A close up photo of one part of our sad, dry orange tree. We are probably up to about 200 oranges lost. 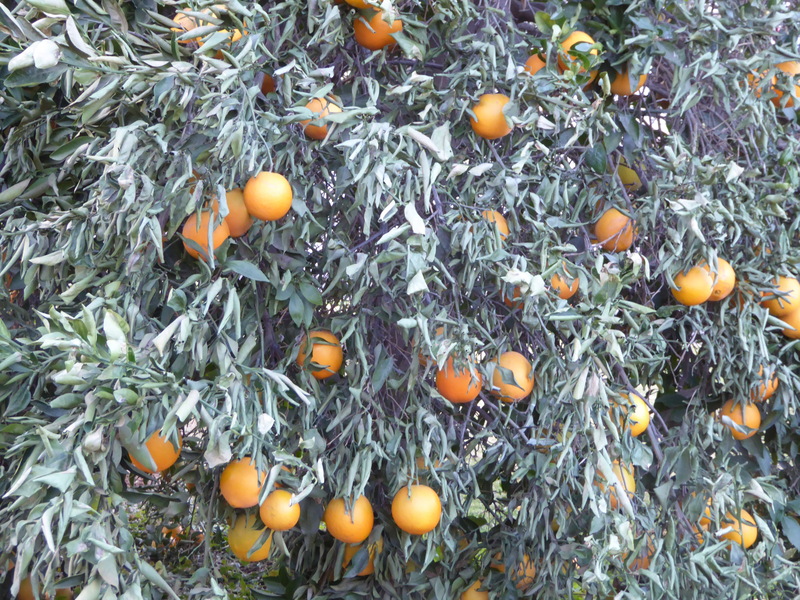 There are still oranges on the tree, of course, but not nearly as many as there were. I need to grab one of the fallen oranges and see how it tastes. Maybe they are good enough for juicing. But we are going to have many friends who are sad about all the oranges they won’t be getting this year. Darn wind.